FRISCO, TEXAS (APRIL 3, 2014) - Opening Night at Dr Pepper Ballpark was off to a hopeful start until rain interrupted the game in the third inning, forcing the contest between Frisco and Northwest Arkansas to be postponed. With the score tied at 2-2 in the third, heavy rains saturated the field and the game was called shortly thereafter. The clubs will take part in double header action Friday afternoon with two seven-inning games, which will begin at 4:05 p.m. and 7:05 p.m.
Gates will open at Dr Pepper Ballpark at 3:30 p.m. for Friday's double header. Tickets for Thursday's game may be exchanged for any RoughRiders regular season home game based on availability. 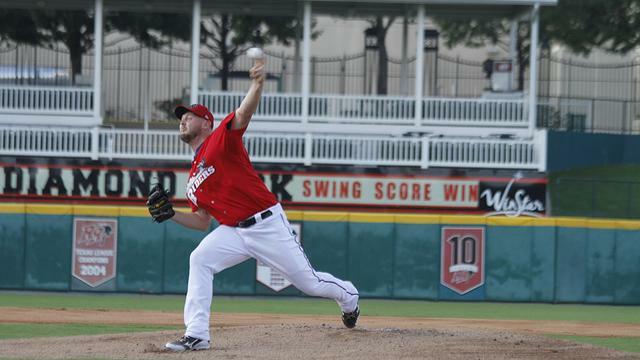 The main headline going into Opening Day was Rangers pitcher Matt Harrison making his first start of the season in a rehab assignment. The tall left-hander retired his first two batters before allowing three consecutive extra-base hits and a pair of runs. He then had a 1-2-3 second inning. The RoughRiders tied the game with two runs in the bottom of the second and after Whit Merrifield led off the third with a double, the rain came and the game was eventually postponed. The results of Thursday's game will not count. For ticket questions about Thursday's rainout and Friday's double header please email info@ridersbaseball.com or call 972-731-9200.